Art helps people to get to know each other. 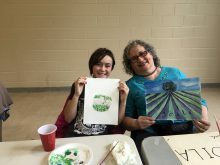 On June 27, a group of immigrant and community seniors met at the McNabb Community Centre to spend a few hours making art and socializing. The room was full of energy and happiness. The objective of the workshop was to create a visual introduction that would help everyone to introduce themselves and remember each other’s name. The event was organized by the Catholic Centre for Immigrants (CCI) Seniors Circles as a part of Welcoming Ottawa Week 2018. The painting session was led by visual artist and CCI volunteer Iwona Buziak-Mohamed. You don’t have to be an artist to find your voice through art. You don’t even have to speak the same language. Art is a universal language.